I often hear LGBT people in Malaysia talk about how our parents are controlling us, how we are so afraid of displeasing our parents to such a degree that we are paralysed, we don’t know what to do for ourselves anymore. We have sacrificed our happiness for the sake of our parents’ happiness — yet they never seem happy enough. So I want to suggest a few ways we can begin the process of seeing ourselves differently in relation to our parents. You see, our parents are imperfect and human like us. Like us, they too have learned from our culture imperfect ways of expressing love. People who have difficulty expressing love will have difficulty perceiving love. People unsure of ever getting love often end up using control to get it. People who see love as a weakness distrust displays of vulnerabilities. They rather have control than vulnerability, obedience than love, until control and obedience become expressions of love. In all societies, parents are not only socially pressured to reproduce children, but also to reproduce the same social pressures through their children. So that their children will carry on the same cultures, values, and conditions. This is how society reproduces itself through families until everyone shares the same values and prejudices, including the same patriarchal, heteronormative, homophobic, transphobic values. And this is how it becomes easier to alienate those who do not conform. Nothing teaches conformity like the fear of alienation. That’s why we are taught that to love our parents is to respect them. The problem is that the terms for this respect is one sided: it demands that we accept their values without challenge or question. When we question them, we are told we are irresponsible, bad, unfilial. And many of us believe this. We have been taught from young to believe that our measure of worth comes from others: our teachers, our bosses, our government. But it is our parents who are the first teachers of this dependency. From young, we learn to look at ourselves through our parents’ eyes. Through their eyes, we learn to see ourselves as others would. We learn that we are nothing without the value of society, the scores from teachers, the salary from our bosses, the status accorded by the state. The purpose of this lesson is a lifetime of self-doubts, and consequently, a lifelong dependency on others for removing these doubts. This is why every decision we will ever make is processed this way: BUT what will my parents feel? Will they approve? Will they be happy? What will four persons say? We are called to imagine the answer, so we each fill it with our worst fear of social alienation, fueled by shame and guilt. It has all the controls you need to regulate people. It also deflects personal responsibility. Nobody has to account for why something is wrong. They just have to blame “people”. Tamil speakers have a very interesting way of expressing “What would people say?” They express it as “What would four persons say?” (“naalu peru eepadi pesuvanga”). The number four is not random. It refers to the four persons who would carry your coffin. In other words, it is saying: If you do this shameful thing to your family now, how will you convince four persons to carry your coffin for you when you die? This phrase brilliantly captures an entire Bollywood film in one line. But it also illustrates a mortal fear that haunts us beyond the grave. 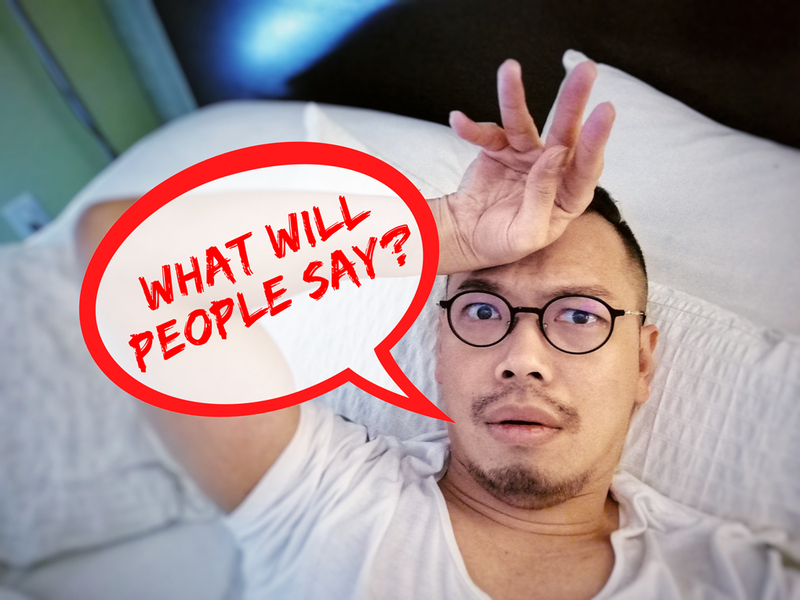 “What will people say?” puts our very legacy, our name, and everything good we might do in this lifetime in a constant state of jeopardy. Perhaps nobody knows the answer to this cursed question because there is no need for answers. It just needs to trigger the fear of forever being alone and forever forgotten. We bear witness to how this fear manifests in our parents every time they ask, “What will people say?” Having sacrificed their own happiness, all our parents have now as they approach the end is their reputation, but their damned ungrateful unfilial children are going to destroy all that! Just as we see ourselves through our parents’ eyes, they too see themselves through their parents’ eyes and the eyes of society. They fear being judged by their parents for being lousy children, being judged by their peers for being lousy parents, being judged by their relatives for bringing shame to their clan or race. Our parents control their fears of society by controlling us, because our worth as children is tied to their worth as parents. From young, they too were subjected to the same cultural pressures. They have remained trapped in the same cages. So now they keep us in there to keep them company. People who live their lives according to “what will people say” never live the lives they truly want. When they do indulge in things for themselves, they do them in secret, with guilt and shame and fear, hoping they would not be found out. Even then, notice how our fathers get away with it more than our mothers. Notice how these pressures apply more to less privileged members like women, children, LGBT people? As society is organised according to patriarchal and economic forces, this allows those with more privilege to transfer the pressures to socially disempowered members. Until the weakest members sacrifice our own happiness and bear the burden for the happiness of the privileged and learn to be grateful! What I want to say is this: the only way our parents can learn to be free is through us. We need to start seeing each other as equal. And that we are responsible for our own happiness first. Our parents’ happiness is not more important than ours. Every single member of society is equal to others. Has it ever brought you happiness? The last time my mother asked me “What will people say?”, I looked at her for a while, then I said, “Can I ask you, since you are the expert of living your life according to what people will say, has it ever brought you happiness?” She was silent. I continued, “Well, perhaps let me try my way then. And if I find happiness, I hope you can be happy for me.” Our parents can totally learn to be happy for us. And for themselves. We need to find our own measure of our worth. This means slowly taking chances in exercising our own choices. Learning to explain that choice to others, to our parents. Learning to talk about what makes us happy. And defend it. Of course they will only want to accept love that comes through specific actions they recognise. Their language for expressing love is very limited, remember? So we need to help them expand their vocabulary. They need to see different models for relating that is free of control and abuse and manipulation. They too need to learn not to depend on others for their sense of value. I want to add that I’ve not proposed any solution. Strategies to free oneself are not one-size-fits-all — what works for some won’t work for others. Some may need many small steps towards independence, some need to walk out the door, some need to fight for it, while others have been kicked out before they were ready. Seeking one’s independence is easier for some than others and the factors have to do with wealth, education, class, gender, ethnicity, religion, etc. So I’m not here to judge why different ones of us are still stuck, why we can’t leave. We are different. So, the step is still yours alone to take. Take it when you’re ready. Then make the landscape easier for others. We won’t change them overnight. In fact, the journey will be frustrating. But we need to start with ourselves. We are not responsible to change our parents. Their change is their own responsibility. But hopefully one day they might be inspired by our change to take their own steps too. Together we can work to challenge these inequalities, these unhealthy social expectations, and change the systems that chain us all, parents and children. Pang Khee Teik is the co-founder of Seksualiti Merdeka and editor of Queer Lapis.